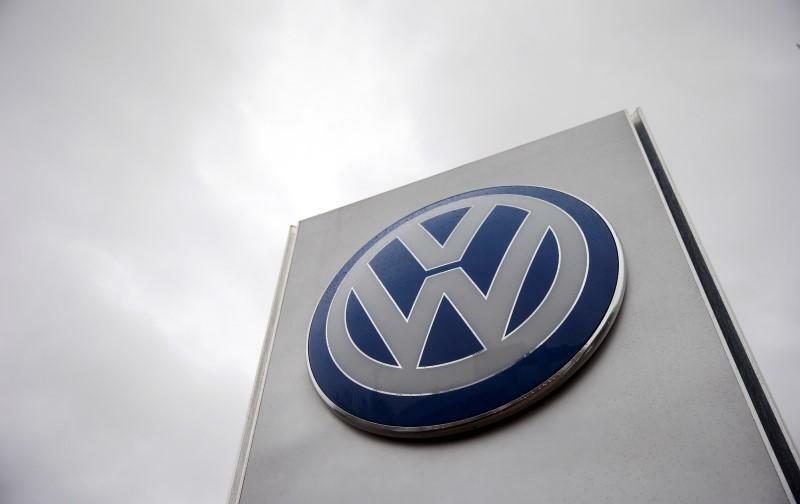 FRANKFURT (Reuters) - Germany's financial watchdog has called on prosecutors to investigate Volkswagen's (VOWG_p.DE) entire former management board over the time it took to disclose the carmaker's emissions test cheating, a person familiar with the matter told Reuters. The complaint filed by Bafin with prosecutors in Braunschweig is a blow for Volkswagen (VW) Chairman Hans Dieter Poetsch and CEO Matthias Mueller, who were both members of the management board - as finance chief and head of the Porsche brand respectively - when the emissions scandal broke. The prosecutors in Braunschweig, near VW's Wolfsburg headquarters, said on Monday they were investigating former VW CEO Martin Winterkorn and a second unidentified executive over whether they effectively manipulated markets by delaying the release of information about the firm's emissions test cheating. The person familiar with the matter said Bafin believed the entire former management board should be held collectively responsible for how the scandal was communicated to markets. Klaus Ziehe, a spokesman for the Braunschweig prosecutor's office, declined to provide details on Bafin's complaint, but said the office's investigations could be widened or narrowed. "This is an ongoing procedure and the number of suspects is not cast in stone," he said. Bafin and VW declined to comment. Bafin's complaint comes just a day before VW holds its annual shareholder meeting, where the company was already bracing for a rough ride from investors who want to know who was responsible for the emissions test cheating. Also on Tuesday, law firm Quinn Emanuel filed a lawsuit in Germany against VW on behalf of institutional funds over the plunge in its share price due to the scandal. Europe's biggest carmaker admitted in September to cheating U.S. diesel emissions tests, forcing out long-standing CEO Winterkorn, hammering its shares and tarnishing its reputation. The company has so far set aside about $18 billion to cover the cost of vehicle refits and a settlement with U.S. authorities, but analysts think the bill could rise further as a result of lawsuits and regulatory penalties. VW and U.S. regulators were in talks for months about the carmaker's emissions tests, but it was not until Sept. 18 that the cheating was announced to financial markets. VW acknowledged in its annual report that it had not grasped the potential impact of the issue, saying the management board at the time thought the costs would be similar to previous cases involving other manufacturers, and so manageable. The decision by U.S. authorities to issue a notice of violation of environmental law against VW on Sept. 18 came as a surprise to the company, the annual report said, adding the "facts and financial consequences then presented the situation in a completely different light." Evercore ISI analyst Arndt Ellinghorst, who has a "buy" rating on VW shares, said he thought it would be difficult to prove that management deliberately misinformed the market in order to manipulate the share price. However, the more current managers are dragged into investigations, the more difficult it may be for VW to persuade investors and customers it has moved on from its troubles. Some investors were critical of both Poetsch and Mueller's appointments in the aftermath of the emissions revelations, saying the company should have picked outsiders to ensure a clean break with the past. Sources familiar with the matter have told Reuters the second executive under investigation by Braunschweig prosecutors is Herbert Diess, the head of VW's namesake brand. In the light of the prosecutors' investigation, VW's supervisory board plans to reopen talks later on Tuesday about whether shareholders should be asked on Wednesday to endorse the management board's actions for 2015 in a vote, another person with knowledge of the situation told Reuters. Such a vote is standard practice for German companies, and while it is only of symbolic importance, it would be an embarrassment for VW if it did not take place, was postponed or if shareholders refused to back the management board. At 1430 GMT, VW shares were down 0.8 percent at 123.6 euros.